Everything you need to know, wrapped in one neat entity. 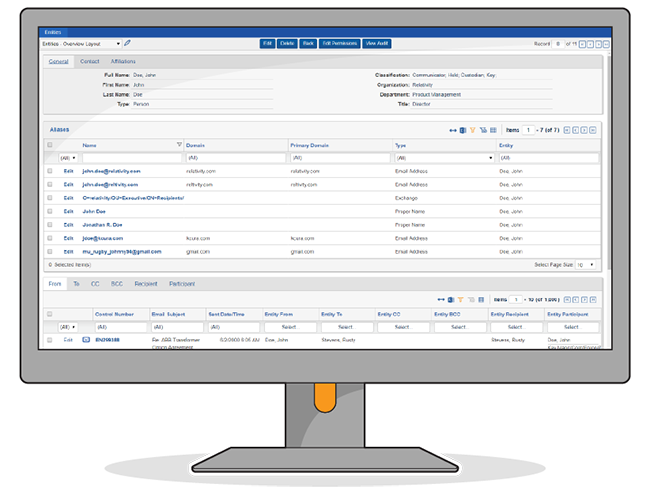 RelativityOne is your complete and secure platform for e-discovery. RelativityOne gives you the tools to tackle any challenge, whether it's litigation, information governance, a government request, or an internal investigation. We strive to make RelativityOne the most trusted and reliable e-discovery solution your organization will ever use. Rest assured: Your data is safe with us. Cybersecurity threats are everywhere. No matter who you are, sooner or later you could be targeted—even by the people you least suspect. With RelativityOne, you’ll never be an easy mark. Get the latest and greatest capabilities. With early access to upcoming enhancements, you can take full advantage of the new stuff as soon as it’s available. RelativityOne delivers all the features and functionality that set Relativity apart, wrapped in an easy-to-manage SaaS solution. Take advantage of the latest in advanced analytics, machine learning, and visualizations to quickly sift through volumes of unstructured data and uncover the facts. Seamlessly move data from Office 365 to RelativityOne to get your review up and running quickly—all in one SaaS platform. Get a better understanding of the people and relationships in your matter with communication analysis—a better way to analyze communications across people and channels. Keep up with performance during peak times, without the work or expense of buying, installing, and maintaining your own infrastructure. Stop worrying about the risk and delay that comes with juggling data between systems. Keep your data in one platform to quickly investigate what’s there and uncover the insights that matter. Deliver a consistent experience to your customers anywhere in the world and easily scale your services and solutions. Store your data when and how you want—from managing a repository for early case assessment or investigations to putting an inactive matter into cold storage. Create applications and automate workflows to help your team meet the requirements of each case. Build custom solutions and create unique workflows for document review and project teams, without prior programming experience. You also get access to the upcoming release, so you can test your customizations without interrupting your production environment. Combine RelativityOne's application-building framework and APIs to create sophisticated products and integrations on top of the platform. Building a solution with market potential? Join the Relativity Developer Partner program to offer your application through the Relativity App Hub. Learn about the Developer Partner program. The legal community relies on RelativityOne to run e-discovery in the cloud. Keep tabs on our cloud platform's latest and greatest enhancements. Leaders in e-discovery share how they instilled confidence in others that SaaS will help them achieve business goals. View our technical documentation for RelativityOne. Get an in-depth overview of the information security practices and operations for RelativityOne.